Another release has come and gone and once again I have had the honor of working with one of the best design teams in the business. This morning I got to peruse the entire August gallery and they have wowed me once again with all of their incredible creations. I thought I would take the opportunity to share a few of my very favorites with you today. This should prove to be an extraordinarily inspiring collection of projects, so sit back, relax and enjoy! Betsy Veldman transformed the tail of the turkey in Gobble, Gobble with pretty bits of our Twill. I love the texture that this detail adds and it got me to thinking how many other things you could layer behind the body. Real feathers? Bits of patterned paper? Layers of fabric? The sky is the limit! 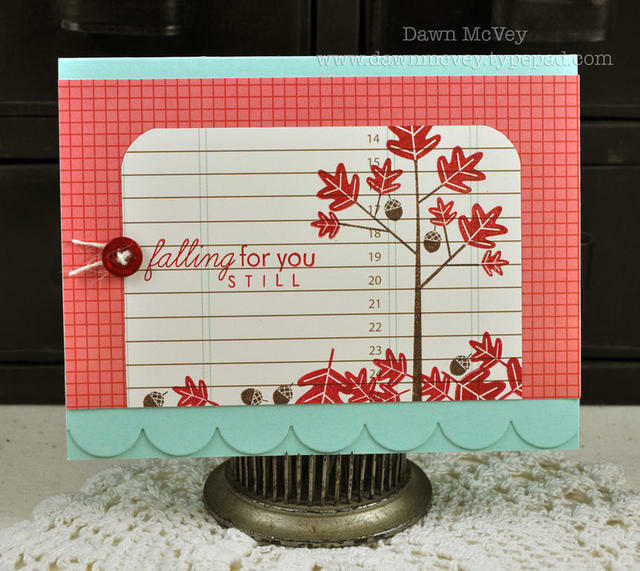 Dawn McVey used a totally unconventional color scheme in conjunction with the Falling Leaves stamp set. I also loved the way she added leaves and acorns to the ground under the tree, which really balanced her design. 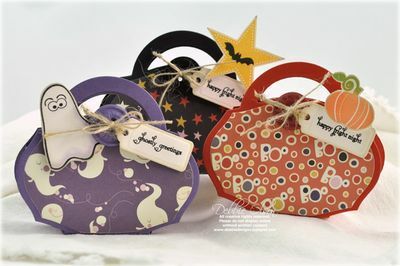 Debbie Olson created an adorable set of Halloween treat bags using the new Favor It Box 1 die. 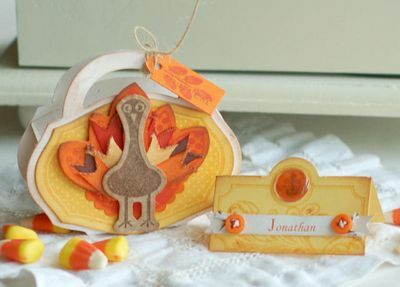 She used the coordinating Mat Stack 1 die to cut her chosen patterned paper and mat the front of these miniature cuties. She created small tags for each of the bags using Been Boo'd. I just love these and can picture them all lined up for party favors! Erin Lincoln used the new Take Three:Fall to create this stunning variegated card. 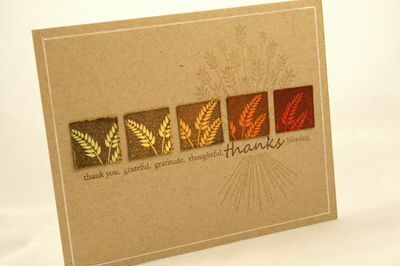 She added the wheat bundle from First Fruits as part of the background which added a wonderful finifhing detail. I also like the whole premise of punching the blocked reverse images with a smaller square punch. Totally gives you more options and variety. Heather Nichols used Friendship Jar and Friendship Jar fall Fillers to make this little masterpiece. 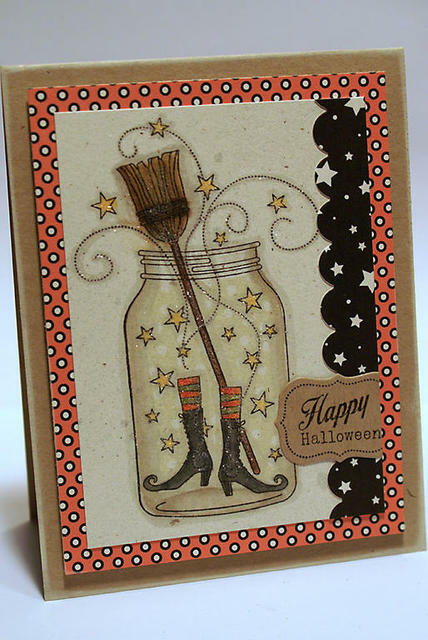 She paired the stamp set with her new patterned paper collection, Halloween Prints, to create a fun & festive flair. Ilovw how she flanked the side of the card with a scalloped border, I always seem to only add them horizontally rather than vertically. Also, adding the label to the side with it partially trimmed was simply genius! Kim Hughes stamped and layered images from Falling Leaves to build this amazing autumn tree. I am also really inspired by how she drew a simple horizontal line to ground the tree and used that design orientation to house her sentiment. Just perfect in every way! Lisa Johnson took my breath away with this soft & stunning Leaf Prints project. The leaves look so realistic and so pretty tucked behind the Rustic Jute Button Twine detail. 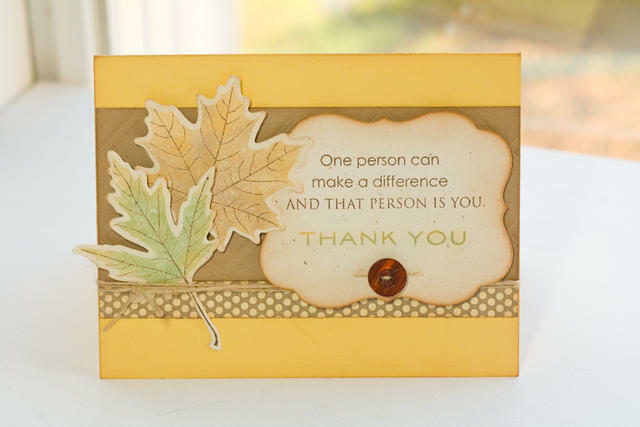 Her use of the new Mat Stack 4 die paired up with a sentiment from Inside & Out: Thank You. This whole ensemble just really speaks to my heart and I look forward to creating one myself. Maile Belles always manages to create with the most stunning simplicity and this project doesn't disappoint. She stamped the tree from Falling Leaves. The detail that steals the show is the amazing frame. It was created with the new Fillable Frames #7 die nested within the Mat Stack 4 die. After die-cutting was complete she added texture with the Woodgrain Impression Plate. Just perfection. 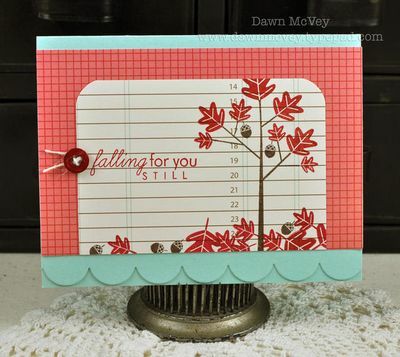 Melissa Phillips designed an amazing project around the new Embellishments stamp set. I love the colors and design of this card along with the way she layered the sentiment over the large fleur-de-lise image. She also added a large die-cut flourish from the set behind the frame as an accent. I just love how the whole thing came together. 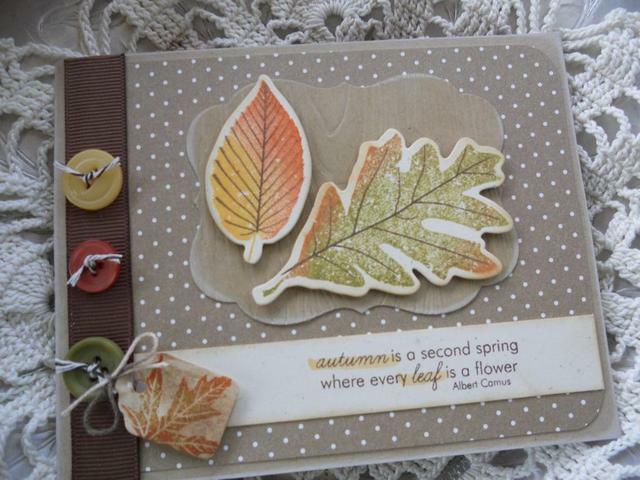 Michelle Wooderson used Leaf Prints to assemble this beautiful tribute to fall. 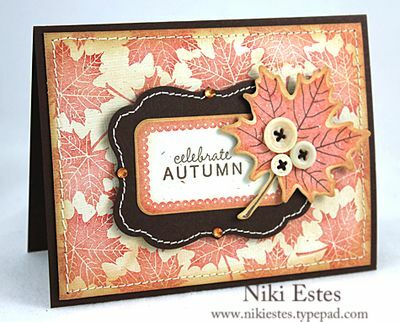 The die-cut & stamped leaves are mounted on top of the Mat Stack 4 shape that has been impressed with the Woodgrain Impression plate. I love how she highlighted some of the words in the beautiful sentiment from Falling Leaves with a marker. Every detail of this project is just stunning. Niki Estes also used Leaf Prints to build a beautiful background. But most of all, Ilove the central frame accent she created. By stitching the Mat Stack 4 shape and then adding the Fillable Fames #7 to it was just brilliant. I love how each point of the frame is also accented with rhinestones. Spectacular! Isn't everything just amazing! I was so incredibly impressed with everyone's creations, it was actually very difficult to narrow it down to eleven favorites! 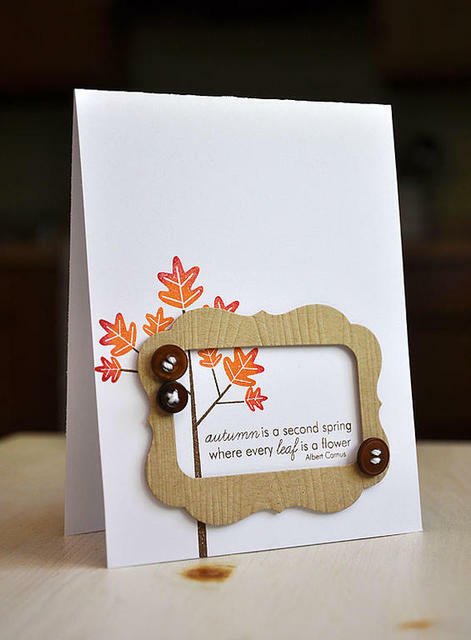 I don't know about you, but I am so inspired for the fall stamping season to begin! It opens up so many more design options! Wow!!! Love these samples. These girls RoCK!! Creative genius at its best. The DT’s samples are so creative and inspirational! It’s like having an online classroom! I’m looking forward to getting this month’s order in the mail. Happy sigh. I love these morning after posts and this one is no exception! Some truly breathtaking designs which make me so happy to look at them! Congratulations on another steller release!! Beautiful! Now I can’t wait for Fall! Thank you ladies, amazing as always. There is absolutely no doubt about it – we were spoiled ROTTEN with eye candy during this release! Thank you so much Nichole, and DT ladies! Even my children are excited about the stamps I’m getting this month :0)! It’s very beautiful, congratulations ! The eye candy has been over the top fabulous this month!! Beautiful job ladies!! You have definitely put together the BEST design team, Nichole. Hats off to you for giving them (and us!) such great stuff to work with every month. I think the variety of clever ideas is way above anyone else! Such gorgeous projects! I can’t wait to play with my new goodies! an amazing release with even more amazing projects. thanks so much for all the hard work. i know you might want the break, but i am already looking forward to sept release!!!! These samples you’ve highlighted are fabulous, yet they do not include my favorites from the DT. It just shows you how truly talented a group of artists you all are. Nichole, thank you so much for all of this beautiful eye candy and for the joy it brings! I am so inspired. wow! the design team never dissppoint. so many beautiful cards – and wonderful, creative ways to use the pti supplies. thanks for all the inspiration. Always enjoy the morning after posts! These are all inspiring and beautiful! I can see that you have gorgeous collections of card. You are so crafty. For me the most beautiful cards that you made are the first one. It is so unique from your other cards. Applause! Applause! Wonderful projects this month! Love it all! Thank you everyone for all the inspiration! 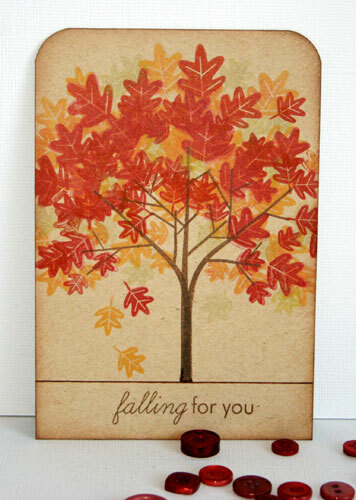 There’s just something about the fall that makes me want to stamp. Love the colors, the ideas. I’m liking the friendship jars a lot, many possibilities. Thanks for sharing. Great job ladies!!! Another month of awesome project by everyone—so very inspiring–I want to try them all! Loved this month’s release!!! Drool, drool, drool…Wow! I am blown away by the cards created here. I love them all! I love your blog! 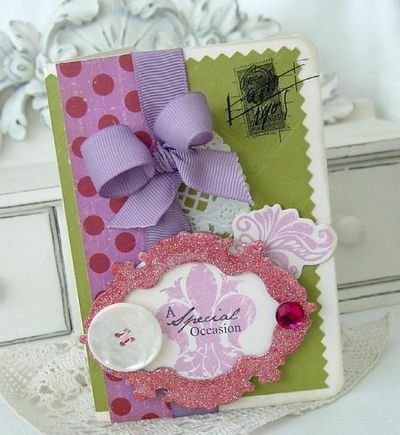 I was sent here from Ren-Yi at Scrap Our Stash blog. So glad I came on over. Going to spend some time looking around at all the wonderful inspiration. I hope that you will continue to make beautiful and gorgeous cards. You have a great talent in making cards and you are very creative in designing. Oh my goodnesses….look at what you all did while I was away on vacation! SO GORGEOUS! NOW must go shopping! Thanks to you, your amazing DT, and incredibly talented designers! ALL THIS after CHA. You guys must be exhausted! Absolutely fabulous sample creations! Such a creative team! All beautiful and fun projects.. congrats to the winners!